This website displays around 400 photographs of animals, people and places in West Africa; all enlarge on-screen at the click of a mouse. I first travelled to Cameroon in West Africa with Gerald Durrell who had asked me to accompany him on an animal collecting trip there in 1957, when I was nineteen years old and had just left Chipping Sodbury Grammar School. This trip was subsequently written up by Durrell in his book ‘A Zoo in my Luggage’. 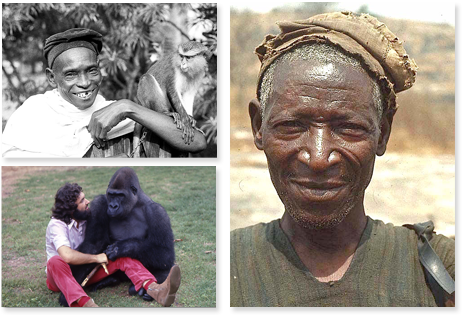 I returned to West Africa in 1963, this time to Nigeria, where I then spent sixteen years as Curator then Director of the Zoological Garden at the University of Ibadan. During that period I developed the Zoo from a small teaching collection attached to the Department of Zoology to the most popular public attraction of any kind in Nigeria. The photographs here feature many animal species native to West Africa – some rarely photographed – as well as people and locations. They tell the story of my work and life in West Africa. They also demonstrate that, as is evidenced by emails and other messages I receive to this day, a properly targeted zoo can be highly effective in stimulating and maintaining an interest in animals and indeed the natural world in people from many different backgrounds. Please click on the headings across the top of this page to explore this website further. Please note:- the enlargeable images in the photo galleries on this website are designed to display on a desktop or laptop computer screen; they may not display in the same way on a tablet or mobile. New story September 2018:- ‘In The Beginning Were Two Chameleons’ – 7,800 words. I describe how, from 1963 and for several years, I built up a collection of indigenous reptiles, and then designed a reptile house where many reptile species were exhibited to the Nigerian public for the first time; and I attempt to describe just how fascinating our zoo visitors, including school children, found these animals once they could observe them in conditions of complete safety. ‘The Magnificent Bee-eaters’ – 4,800 words. I visit and describe some of the breeding sites of the northern carmine bee-eater in the banks of the River Niger in western Nigeria before and after the closing of the Kainji Dam in 1968. I managed to send a few of these birds to London Zoo – the first the Zoo had ever exbibited. ‘The Absent Elephant’ – 7,200 words. I describe and discuss, with photographs, the two African forest elephants (Loxodonta cyclotis) in the University of Ibadan Zoological Garden, Nigeria, the only forest elephants I have ever seen. I also describe how I met my wife Peaches, an American, in Nigeria, and how she became the High Sheriff of Bristol in 2010 and Lord Lieutenant of Bristol in 2017, the Queen’s personal representative in that County. ‘The Leigh Woods Python’ – 4,700 words. This is a story about a royal python from Nigeria that lived with me in Bristol, England, for more than 25 years. ‘The Christmas Gorillas’ – 5,200 words. I relate how, on Christmas morning 1970, two young gorillas reacted to my surprise visit to them while still dressed in a Father Christmas costume and how they seemed not to recognise me until I spoke. ‘The Green Mamba’ – 5,400 words. This tells how a zoo keeper from the University Zoological Garden was bitten by a green mamba, not in the Zoo but a long way from home, and nearly died after being injected in hospital with the wrong antivenom! To download – for printing or reading – any of the six short stories above, simply click on the button ‘True Short Stories’ at the top of this page then click on the story you want. Each story will appear on-screen as a PDF document that can then be downloaded and printed. Bob Golding, Bristol, England, 2019.